Go to My Shaw Direct. If you are already registered, enter your account number and password and then click “Sign in”. You will need to create a password to go with your Shaw ID. if you have already registered for one, use the forgot password link instead. Once you have entered your information click "Create a Shaw ID" and follow the . Once logged into My Shaw Direct, click on "My Bills" on the left. Click on the "Set up" button in the eBill box and follow the instructions on the screen. You can unsubscribe anytime by clicking the "Unsubscribe from eBill" in the same box. Sign in to My Shaw Direct. Click on "My bills" on the left and scroll down to the Account History box. You can view PDF bills or select a date range to display transactions. A total of 24 bills are available, current and 23 previous months. The oldest invoice available is from January 2017 due to the recent change display up to 24 months of invoices. How do I cancel my paper free billing? 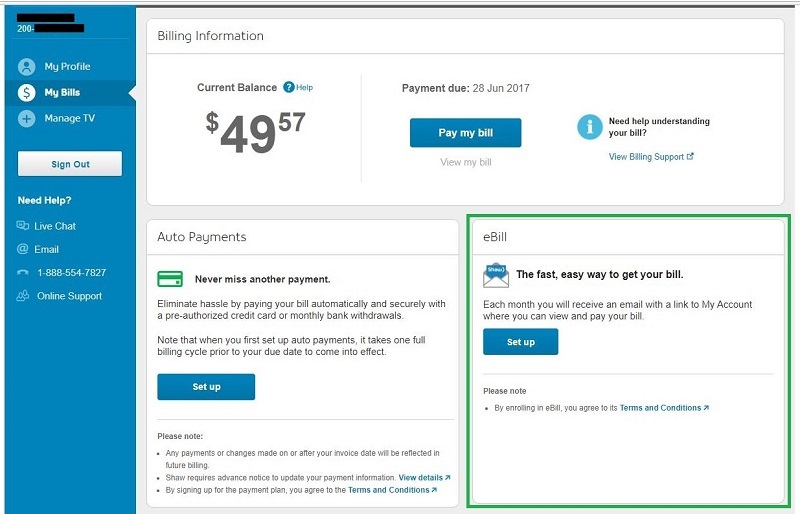 You may at any time unsubscribed from paper free billing by selecting the “Unsubscribe” option as explained in the example above. Why did I get an invoice after I subscribed? Depending on the date when you subscribed we may have already printed and mailed your invoice. Can I print a copy of my invoice? Yes, you may print a copy of your invoice from My Shaw Direct > My bills > Account history. When will my bill be available to view? If you are currently on pre-authorized payments your bill will be available to view online 12 days prior to the invoice date, for regular monthly invoicing bills become available 2 days prior to the invoice date. You will receive a notification email once your bill is available to view. My account was deactivated from Paper Free Billing and I am getting paper bills again, why? When a customer’s account is overdue more than 38 days after due date, the account is automatically deactivated from paper free billing and we then mail out a notice to the customer. Once the overdue balance on the account has been cleared, paper free billing can then be reactivated.